Homestead, FL – April 7, 2019 – An important premiere such as this calls for a remarkable venue. 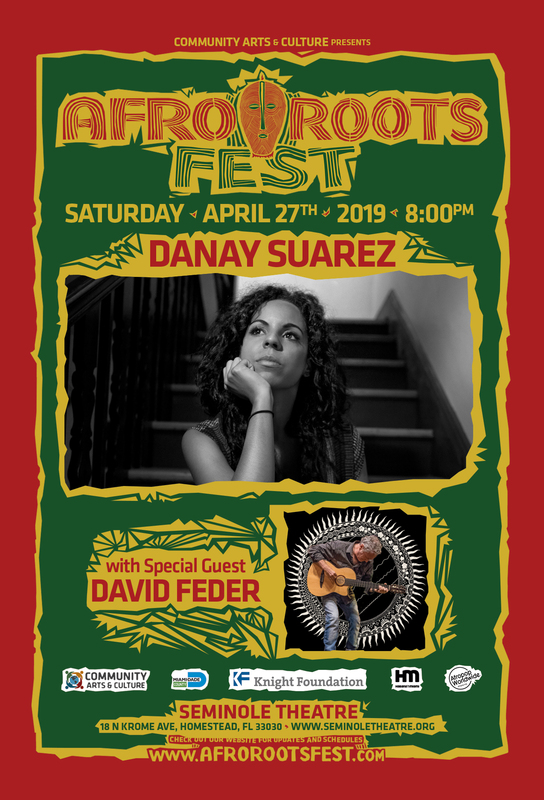 The Afro Roots Fest will make its debut in the City of Homestead at the historic Seminole Theatre (18 N Krome Ave, Homestead, FL 33030) on Saturday, April 27, 2019 with a special presentation of Cuban singer / songwriter Danay Suarez and Islamorada-based guitarist David Feder beginning at 8 p.m. Tickets for the all-ages show are available online at bit.ly/ARH19. The event is being produced and presented by the Miami-based musical non-profit Community Arts and Culture (CAC). The four-time Grammy-nominated Suarez is a thoughtful, eloquent vocalist who singularly combines soul and hip-hop with reggae and the traditional Cuban styling called son. Her latest offering Palabras Manualesfeatures contributions from Stephen Marley, Idan Raichel, Roberto Fonseca and Jason Matthews. A veteran of many major national and international music festivals, Danay won the prestigious La Gaviota de Inspiración award during the 2017 Festival Viňa in Chile. Feder fuses his background of jazz and classical music with Flamenco folk stylings and a multi-cultural island vibe. His music has been featured on NPR’s All Songs Considered, World Café Live, PBS Art Loft, NPR’s Folk & Acoustic Music, among other outlets. Feder spent six weeks at the top of the Broadjam World Music Chart with his critically acclaimed album “Black Emerald” and has been featured on All My Children(ABC), Art Loft (PBS), the NBC Good Morning show, National Park Service educational videos, and Florida Everglades documentaries. Now in its 21st year, the Afro Roots Fest – named one of “South Florida’s Ten Best Music Festivals” by the Miami New Times – is a travelling affair that brings music from the African diaspora and the Caribbean to the masses. This event is being made possible with the support of Miami-Dade County Department of Cultural Affairs, and Knight Foundation. For more information, call 786.650.2073 or visit www.AfroRootsFest.com. Incorporated in September 2002, Community Arts and Culture, Inc. (CAC) is a Miami-based non-profit organization that fosters an appreciation and understanding of a vast assortment of arts and cultures through workshops, lectures and artistic performances in local communities for individuals of all ages and social backgrounds. In addition to the joint venture with the Little Haiti Community Center called Let the Children Have Music, and the ongoing World Music Tuesdays series at the Wynwood Yard, CAC co-produces the Roots in the Schools program, which brings music to Miami-area schools. For more information, please visit www.communityartsandculture.org. This entry was posted in Blog and tagged Afro Roots Fest, Danay Suarez, David Feder, homestead. Bookmark the permalink. Miami, FL – February 14, 2017 – Soulful Cuban songstress Danay Suarez will celebrate her highly-anticipated new release Palabras Manuales on Wednesday, March 8, 2017 with a free 18 and over show at El Tucan (1111 SW 1st Ave, Miami, FL 33130) featuring a number of surprise special guests. The first single from the collection is called “Integridad”, which will be released February 17 and features Stephen Marley. The artist was born and raised in La Habana, Cuba, and is recognized as one of the principal figures in Cuba’s underground rap movement. Thoughtful and eloquent, Danay uniquely combines soul and hip-hop with reggae, and the traditional Cuban styling called son. For more details, visit www.DanaySuarez.com. For more information about the venue, navigate to eltucanmiami.com or call 305.535.0065. This entry was posted in Blog and tagged Danay Suarez, El Tucan Miami, live music. Bookmark the permalink. Jupiter, FL – September 7, 2016 – When soulful Cuban songstress Danay Suarez returns to an adoring crowd at Guanabanas Island Restaurant and Bar (960 North Highway A1A, Jupiter, FL 33477) on Saturday, September 17, 2016, it will mark the second time she has performed at the venue, and will be ahead of her highly-anticipated new release titled Palabras Manuales. Her debut there earlier this spring was such a complete and total success that anticipation for a return Noche Latina event remains high. The event is free and open to those 21 and over; music begins at 9 p.m.
“Danay’s first show here drew an impressive crowd of her fans, some who had travelled from far away just to attend,” says Guanabanas’ Talent Buyer Matt Cahur. “We expect another great turnout for Noche Latina and another majestic performance by Danay. Fans of hip-hop and reggae alike should not miss this show.” South Florida’s cultural diversity and Jupiter’s thirst for Latin music compelled Cahur to conceive and launch the night last year. Recently featured this season 2 of CNN’s “The Wonder List”, the thoughtful, eloquent vocalist singularly combines soul and hip-hop with of reggae and the traditional Cuban styling called son. This makes her an ideal candidate for Guanabanas’ on-going Latin music night, which showcases a prominent local, regional or national Latin music artist on a monthly basis. A one year anniversary event is scheduled for October 22, featuring Miami’s Electric Piquete and the Spam Allstars, two groups steeped in Latin funk. Slated for release in late October / early November, Suarez’s new release is mixed as one seamless record and will feature contributions from Stephen Marley, Idan Raichel, Roberto Fonseca and Jason Matthews. Earlier this year, Danay was featured in the Huffington Post under the headline “Meet the Cuban Hip-Hop Artist You Probably Don’t Know, But Should”. She has since played numerous high-profile U.S. festivals and live dates, as well as dedicated time to put the finishing touches on her latest work. For more details about the artist, navigate to www.DanaySuarez.com. For more information about the venue, please visit www.Guanabanas.com or call 561.747.8878. Guanabanas is an open air restaurant and bar with woven tiki huts and banyan trees towering overhead and hand-chiseled coquina stone pathways underfoot. The team maintains a laid-back, island atmosphere where everyone is welcome. The award-winning menu features a fusion of Mexican, fresh Florida seafood and traditional fare; a breakfast menu is available Saturdays and Sundays. Guanabanas offers a custom catering menu and signature cocktails. Executive Chef Vinny Trupia overseas the culinary operations there. The establishment hosts recurring “Give Back Thursdays” to help the needs of the local community organizations, partnering with willing companies to help drive donations and money where needed, as well as giving away stage space to allow charities to showcase their cause. Past beneficiaries include the Surfrider Foundation, Pink Purses, Martin Memorial Hospital, Haiti Relief Effort, Freedom Flight for WWII Vets by the Martin County Firefighters, Jupiter High Surf Team, Friends of Jupiter Beach, Vita Nova House, Furry Friends, and many others. For more information, visit www.Guanabanas.com or call 561.747.8513. This entry was posted in Blog and tagged Danay Suarez, guanabanas, jupiter, live music. Bookmark the permalink. 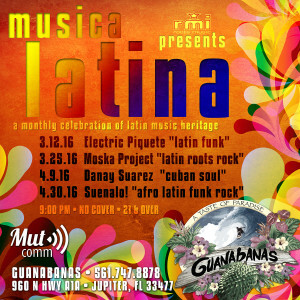 Jupiter, FL – March 29, 2016 – Guanabanas’ monthly Latin Music Night has a special treat for attendees with the Cuban songstress Danay Suarez set to make her debut there Saturday, April 9, 2016, beginning at 9 p.m. The water-front venue is located at 960 North Highway A1A, Jupiter, FL 33477, and the event is free and open to those 21 and over. The thoughtful, eloquent soul singer, featured this month on season 2 of CNN’s “The Wonder List”, uniquely combines soul and hip-hop with elements of reggae and traditional Cuban son. Suarez was also recently named one of Fader Magazine‘s “9 Cuban Artists You Need To Know Right Now”. Danay is currently recording her next full-length release titled Palabras Manuales, which will feature contributions from Stephen Marley, Idan Raichel and Jason Matthews. Her latest release is called “Flores“. Inspired by South Florida’s musical and cultural diversity, Guanabanas’ Talent Buyer Matt Cahur conceived the Latin night series in October of 2015, and launched it just after Hispanic Heritage Month. The night has already showcased some of Miami’s top Latin bands, including the Spam Allstars,Suenalo (who are scheduled for a return date April 30), Lanzallamas, Moska Project, and Electric Piquete. Guanabanas is an open-air restaurant and bar with woven tiki huts and banyan trees towering overhead and hand-chiseled coquina stone pathways underfoot. A full, sumptuous dinner menu is available, as is a full-liquor beverage selection. This entry was posted in Blog and tagged Danay Suarez, guanabanas, jupiter, live music, roots music. Bookmark the permalink. Miami, FL – December 1, 2015 – Hialeah Park, long known for thoroughbred and quarter horse racing, and recently revitalized with an ongoing $60 million remodeling project, has now turned its attention to providing excellence in live musical entertainment. Beginning in August with local Latin funk group ElectricPiquete and continuing in October with Latin-Grammy nominees Locos Por Juana and most recently featuring ¡MAYDAY!, the series brings reggae roots heir Jo Mersa Marley, grandson of Bob Marley and eldest son of Stephen Marley, and Cuban Soul singer / songwriter Danay Suarez to the park on Saturday, December 19, beginning at 9 p.m. Show is free and open to the public of all ages; must be 21 to enter the casino. “The Brunetti family has put quite a bit of stock into reviving the legendary national treasure that is Hialeah Park,” says Vice President of Marketing & Entertainment Frank Fiore. “This musical series is just another example of their commitment to providing the best possible entertainment to patrons.” The track, which first opened 1925 as the Miami Jockey Club, has been home to legendary horses and races, been featured in Hollywood films, hosted countless quinces photo shoots, weddings and special events, and recently unveiled the new Private King’s Court VIP addition to its poker room. Jo Mersa Marley is descended from a rich history of Jamaican reggae roots and grew up surrounded by music. By the time he was four, Jo was appearing onstage alongside his father, uncle Ziggy and aunts Cedella and Sharon (a.k.a. Ziggy Marley and The Melody Makers) and their children as part of the group’s rousing concert finales, with Jo often taking the mic and chanting the lyrics to the Melody Makers’ biggest songs. Born in Kingston, Jamaica on March 12, 1991, he moved to Miami at age 11 where he keenly observed his father and his uncle Damian as they created music in Stephen’s Lion’s Den studio. The artist is currently promoting is latest release, the Comfortable EP. 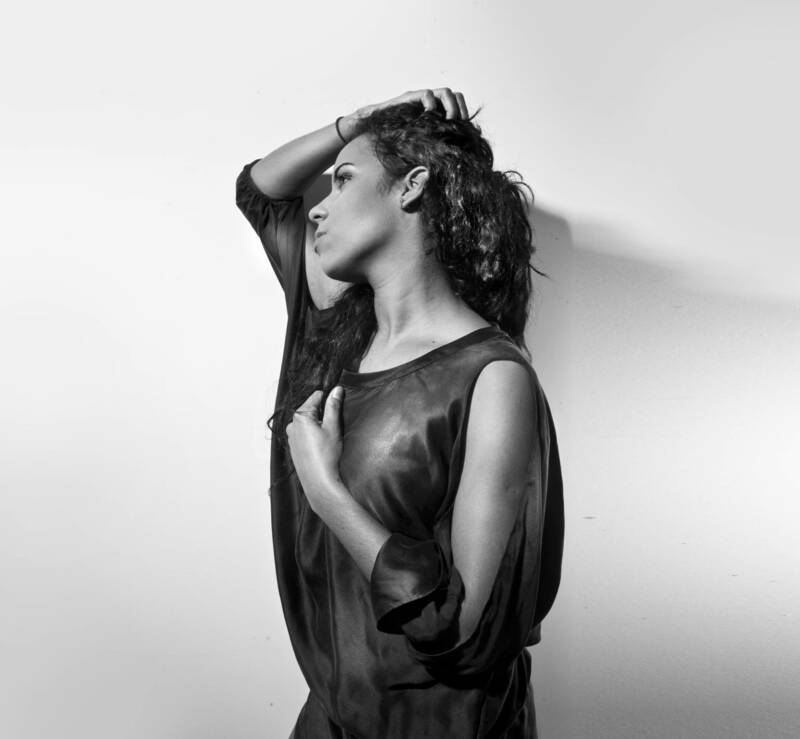 Suárez, originally from La Habana, Cuba, has been generating a buzz throughout Latin America and Europe with her soulful voice, razor sharp lyrics, and innovative musical style. Performing since the early age of 15, Danay formed part of Havana Cultura series collaborating with various artists throughout the years and has performed in Europe cities such as London, Paris, Amsterdam, Berlin, and Istanbul and in Latin America, Mexico, Panama and Colombia. She’s released Polvo de la Humedad in 2008, Havana CulturaEP in 2010, and will issue Palabras Manuales in early 2016. The night is being hosted by Kulcha Shok Muzik featuring Lance O. The series will resume with an appearance by the Spam Allstars in January and PALO! in February. Hialeah Park is located at 2200 East 32 Street, Hialeah, FL 33013. For more information, please visit www.HialeahParkCasino.com or call 305.885.8000. 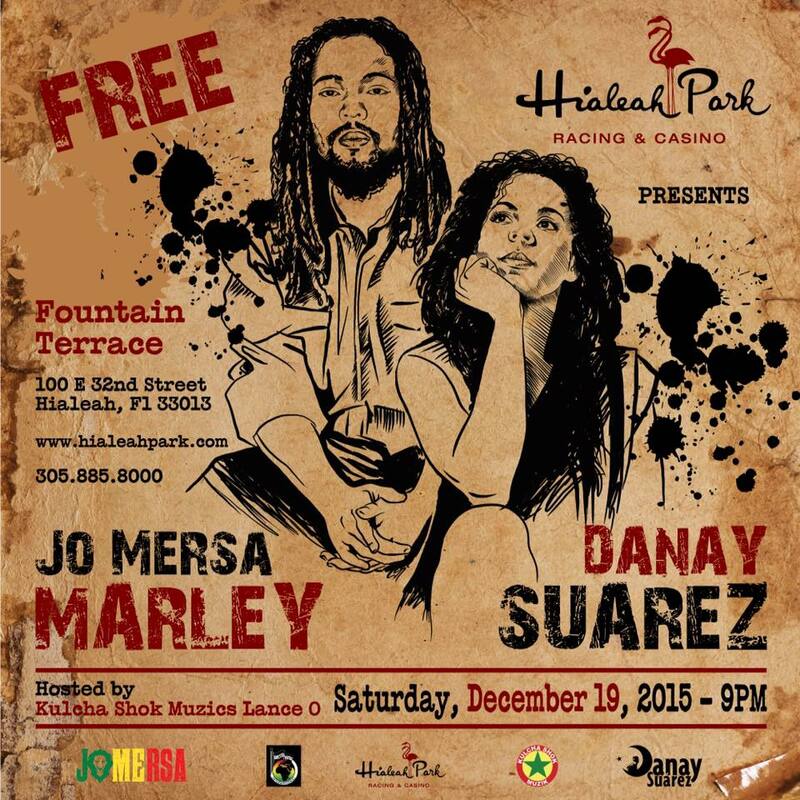 This entry was posted in Blog and tagged Danay Suarez, hialeah park, Jo Mersa Marley. Bookmark the permalink.